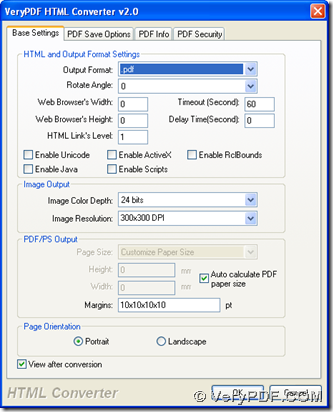 With the help of HTML Converter, you can easily convert RTF to PDF in Windows systems. For more information of HTML Converter, welcome to log on official website of HTML Converter. Please download installer of HTML Converter, then double click this installer and follow setup wizard step by step, so HTML Converter can be installed successfully. Step2. 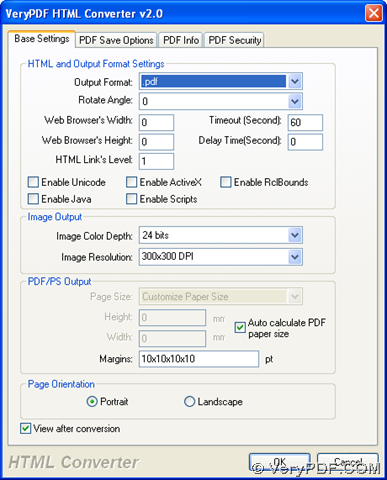 Please open GUI interface of HTML Converter, then you need to add RTF for your conversion: click “Add Files” > select one RTF file and click “open” in dialog box of “VeryPDF HTML Converter v2.0”, and you will find path of this RTF file can be shown in processing form, which indicates it is successful to add this RTF file for this process. Step3. Then, you need to set targeting format as PDF: click “Setting” on GUI interface, then select tab “Base Settings” on setting panel. And please click “.pdf” on dropdown list of “output format”, at last, please click “ok” there so that this setting can be saved automatically. Step4. To select targeting folder for saving PDF file and start process, please click “start” on GUI interface, then select one folder in dialog box of “Save As”, at last, to make this setting effective and start your process, please click “save” there so that your PDF file can be added into targeting folder on your computer. This entry was posted in VeryPDF Blog and tagged rtf to pdf. Bookmark the permalink.